I think the toughest trips to plan turn out to be the most memorable. The idea of a team trip had been in the pipeline for a long time but always failed to materialize due to unforeseeable circumstances. This time too it was on a bitter-sweet note that we were all rushing to the railway station to catch our early morning train. I can honestly say I’m not a morning person, but having said so I do grudgingly accept – ‘Yes’, there is something magical about the early morning freshness’. I could see the excitement and the pent-up energy on everyone faces along with the look, “We are finally going” …..
Getting thirteen seats together at the last-minute turned out to be an ordeal that was as frustrating as sitting with hot chocolate fudge in hand and not having a spoon to dig in. Finally, we managed to get seats on Shan-e-Punjab – Non AC Chair Car. College was the last time that I travelled in a train where I could open the window. After that I had become the ‘Elite Class’ not mixing with the common gentry. I could feel it in my bones; this train journey was going to be exciting. Our compartment was milling with people, some trying to adjust their luggage while others were more interested in hitching along for a free ride. The clamor was deafening. As the train left the platform, things calmed down a little. Within two hours of starting our journey everyone was having pangs of hunger. Most of us had packed something to munch on the way. Seasoned travelers and a mom, Jyoti had the time to get up early and make aloo parathas for us, whereas less adept people like me just managed to throw one or two ready to eat items together. Eating out of tiffin boxes reminded me of all the books Enid Blyton wrote where there would always be one or two mid night feasts. But the fresh morning air and travel makes even the fussy eaters get a voracious appetite. So when the train stopped at Ludhiana Junction, we all got down to pick-up local goodies from the station. The exciting thing about travelling in a Non-AC compartment is all the assortments of sellers that climb aboard to sell their wares. From intoxicating aromas of snack food, ten in one pens, to key chain sellers; the train had the hustle & bustle akin to any small town market. I’m happy to say that by the end of the journey we had made many hawkers retire early for the day. But the highlight of the train journey was ‘Akum’, a small Punjabi girl who refused to stay with her parents, but instead adopted my friend Dipin’s lap as her preferred mode of transport. Try as he did Dipin could not dislodge her from her seat for more than a few minutes. In the end she was sharing her food with us and was our on-board entertainment. We had a tempo traveller waiting for us at theAmritsar station and it was a short 10 minutes drive to our hotel – Mango Suites. By the time we checked in, it was already late afternoon. Not to waste more time than necessary, we all agreed to meet down at the lobby in an hour after freshening up. By 1730 hrs. all of us we so hungry that we trooped into the closest eating joint that we saw; Kumar’s Convention & Banquets’. I’m not joking, this guy saw us as little lambs, which had come willing to a slaughter-house. By the time we were through with our food we had clocked up a bill of INR 2700 which is exorbitant by Amritsar standards. When everyone was satiated we proceeded to Katra Jaimahal Singh, the main market. I’ll let you decide what we did next with five women in our team. Hahaha….ha you guess it right “Shopping” of course. 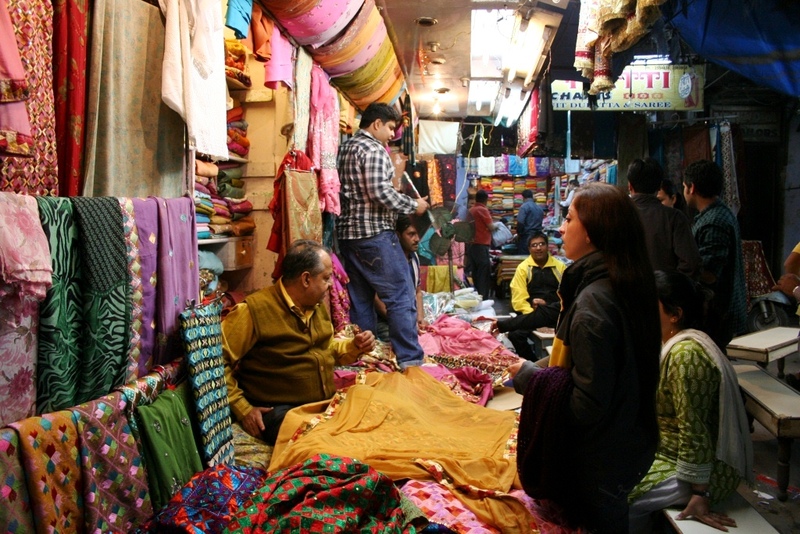 I had only one item on my list, Phulkari. I had enlisted my female colleagues to do all the dirty work. Cross my heart when I say, I mean this in complete awe and respect. Women have an amazing way of shooting down any price that a shopkeeper quotes and ask a price that if said by me, I’m sure the shopkeeper would chase me with a bat. I will not lie, even I enjoyed the experience as the weather was perfect and the meandering lanes did not have any locomotive traffic. Most of the shopkeepers were more that eager to show their wares and had loads of variety to keep us busy for half an hour in most of the shops. After clothes it was shoes. None of us wanted to miss the bargains as we had people who knew where to go to get the best deals and everyone ended up buying in dozens. Fortunately everyone in the team is a foodie and understood one cannot enjoy on an empty stomach. Putting shopping on hold for day one, we went straight to Makan Fish Wala. It is a small place with open counters out in front and a seating area at the back. Everyone wanted to eat in a relaxed atmosphere so we packed our food (fish fry and tandoori chicken) and went to our hotel. Food when shared has a completely different taste in itself. After a sumptuous meal while talking nineteen to a dozen we had a game of dumb charades. With everyone in high spirits and movie names (concocted) like ‘Ganga mei behti lash’ it was a ball. Around four o’clock it dawned on everybody that the next day (which had already started) was going to be jam-packed. Grudgingly we all decided to grab a few winks of sleep. The highlight of day two apart from Wagah Border was the lunch at ‘Kesar da Dhaba’. I had been to Amritsar before but if you don’t know the place, I can say with conviction that you will not stumble upon it by mistake. The food was yum. All vegetarian though. The best way to reach the place would be on foot (if you know your way around that is) but we took a tuk-tuk. The narrow lanes will remind you of the alleys of Banarus, with shops on both sides and the sun playing hide and seek. One could spend hours and hours just meandering through those lanes. We were on a time line, since we had to reach Wagah border by four thirty to avoid the crowd. 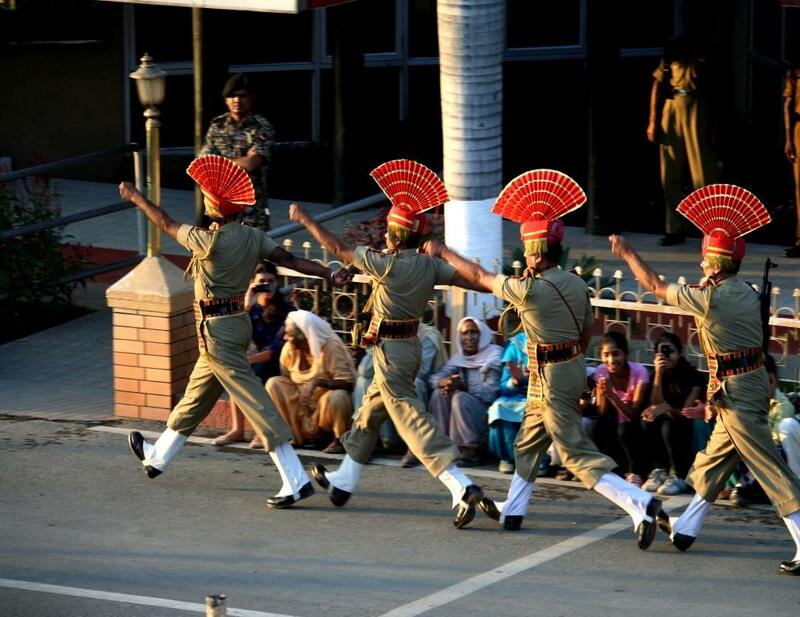 The only way to experience Wagah border is if you have a VIP pass, otherwise it’s very difficult to view the spectacle. The entire ceremony is for about an hour. What one does not expect is once the patriotic songs starts you have people dancing on the streets. It’s a wonderful sight, people dancing uninhibited. Nirmala my colleague was itching to join them but was unfortunately stuck with us on the top-tier. We enjoyed ourselves thoroughly clapping, cheering and shouting ourselves hoarse. We ended day two at the Golden Temple. I don’t know if my shots do justice to the spectacle but the temple at night looked like a mirage; a golden body floating serenely in the center of a sarovar (small water body). I spent a peaceful hour sitting next to the water, drinking in the calm & peacefulness of the place. I sat with closed eyes in one corner of the sarovar and felt all my tensions and worries float away. Before leaving the Golden Temple don’t miss the nutri-kulcha just outside the temple. The owner has a small stall barely more than 4 feet long but you would be amazed how well he uses the space to dish out his creation to the never-ending stream of devotees. That night all of us slept like logs; the entire days of excitement had got to us. Our train back on day three was in the late afternoon. Everyone had the morning free to spend it as they wanted. Some of us went to the Jallianwala Bagh, a public garden where thousands of peaceful celebrators were murdered by the British on the occasion of the Punjabi New Year. And would you believe it some of us still had some last-minute shopping to do. If we were to catch a flight all of us would have had excess baggage. Since this trip had materialized after so much planning, I think everyone had a feeling that it wouldn’t be soon that we will all travel again together. In hindsight I see that this is true. 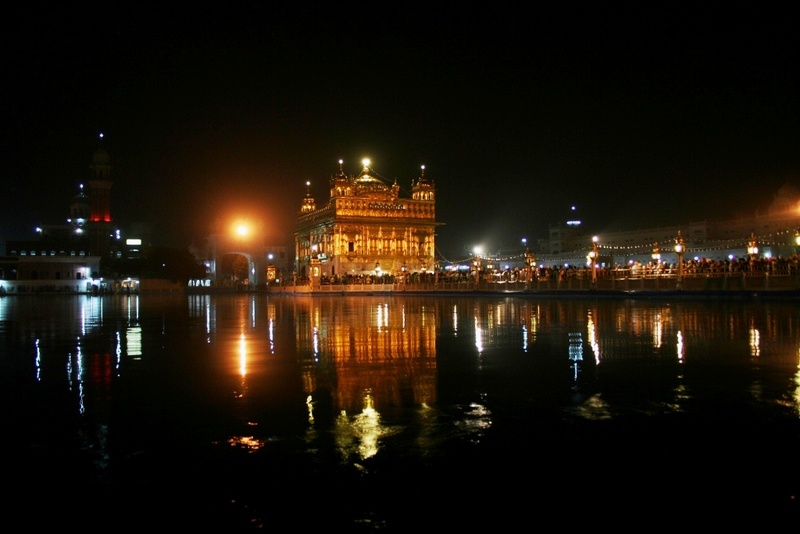 Do visit Amritsar if you still haven’t …… The Golden Temple, Food, Shopping & Jallianwala Bagh. Here’s a toast to the city, “Till we meet again”. Visit Golden temple at night. Do Wagah border only if you have a VIP Pass.